Chasing, but not chasing wind. If you operate in the track and field world, you know this: 2016 is defined by the Olympic Games. Some athletes are eating, sleeping, and dreaming OLYMPICS. Nothing else matters. This time 2 years ago, I would have wished that was me. I would have wanted people to say “that girl is so focused- nothing can distract her from track and field. Nothing.” This may sound undedicated or unpassionate, but here it is: I’ve been freed from that! (It’s an ongoing battle) I’ve been saved from the mind-trap where striving overpowers joy. 22 What do mortals get from all the toil and strain with which they toil under the sun? 23 For all their days are full of pain, and their work is a vexation; even at night their minds do not rest. This also is vanity. 24 There is nothing better for mortals than to eat and drink, and find enjoyment in their toil. This also, I saw, is from the hand of God; 25 for apart from him who can eat or who can have enjoyment? 26 For to the one who pleases him God gives wisdom and knowledge and joy; but to the sinner he gives the work of gathering and heaping, only to give to one who pleases God. This also is vanity and a chasing after wind. So am I calling the Olympic dream a vanity? No way! It’s true that we take nothing with us out of this world… that means not even the status of OLYMPIAN or the status of ATHLETE or any winnings for that matter. But God did assign us all a task and told us to do them “heartily as to the Lord”. His gift to us is the power to take pleasure in and enjoy our toil. How? By having good purpose. When our motivations are prideful (or for recognition/status), is there really enjoyment in the toil? When the thought of not achieving the goal causes you to sin, are we really enjoying the process at all? We all have toil- our days are meant to stay busy, but where is your heart? Does it recognize that all you could possibly gain is only temporary? Do you know that our days on earth are short? Strain and strife and stress are not from God… peace and love and joy are from God. Take a deep look at your life- what is really defining it? So like I said, the Olympic dream isn’t the vanity, but the motivation behind it may be. God calls us to work hard! So maybe you relate to my story and you have a sense of emptiness in the midst of your goal-chasing. Ready for the practical key to finding enjoyment in your toil? Hah… me too. I don’t have the answer. I just know that some days it’s a battle to keep my eyes on the greater purpose rather than my fleshly desires to make everything a competition. Every morning I need to pray for the discernment between working hard and spinning my wheels in strife. When I’m anxious, unforgiving, or unloving, I know I need to check myself. When my work is worship, I’m not chasing wind. I can say this- it wasn’t my will to ever discover that my rigidity actually wasn’t enjoyable. I felt defined by and proud of everything I was willing to give up in order to achieve my goal. In fact, my first lingering injury threw me into all kinds of emotional turmoil. It forced me to loosen up on my rigid habits and for the first time consider that this isn’t what life is all about. Meanwhile, God was working out a few other situations too… 1. A move to Phoenix which resulted in meeting people who encouraged a peace-seeking perspective. 2. 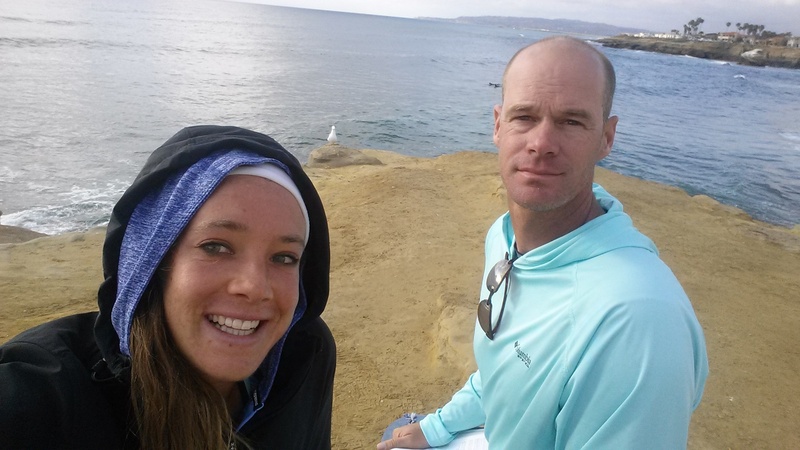 Financial stress resulting in a high school coaching job and a whole new understanding of loving others. 3. A friendship (with Kyle) being transformed into true love. Post-track-meet fun in the snow with my soon-to-be-husband! I hope this blog leaves you with 3-lasting thoughts: First, Life is meant to be enjoyed and the ability to do that is gifted from God. Second, if you are struggling to find joy rather than strife, check yourself at a heart level. The circumstance doesn’t make you a certain way (anxious vs peaceful), but when you identify your worth by a specific task, it becomes difficult to enjoy your God-given duties! Finally, a circumstance that appears disastrous may actually be one that improves you! Are you spinning your wheels, striving for perfection and coming up feeling empty? Are you chasing after a greater purpose or are you chasing wind? It’s easy to hide the answer from yourself. Which doors are God opening for you to change your heart’s attitude? So friends, work hard at loving others in whatever job/task/toil/duty you do! put on the armor, it’s a big year ahead! Maybe you’ve seen the hype this week announcing the 1-year date before the 2016 Olympic Games begin!? The USA Track and Field team will be announced early July of 2016 following the Olympic Trials in Eugene, Oregon. The top 3 athletes in the heptathlon will waive their American flags in elation as they run a victory lap. The victory lap represents all the hard work they’ve put into the sport, all the people that have supported them, all the struggles they’ve had to overcome, all the friendships and growth resulting from the sport, all the blessings God has bestowed upon them, and an opportunity to compete for USA at the OLYMPIC GAMES. Wow. Do you get the chills? 2016 will be my 3rd Olympic trials (God-willing). Four years ago I took 7th place. Since that date, I’ve spent 3 years training for another opportunity, and HERE IT IS. I sure haven’t taken a direct path. I’ve made mistakes… become too consumed by the sport, fallen into faulty dieting, experienced sprains, strains, tears, and fractures, lost sponsorship, let doubt win, felt broken. But here I am, with hope and ARMOR. I have no idea what is in store for me in the year ahead, but I’m going for it and I’m going to let God take the wheel. 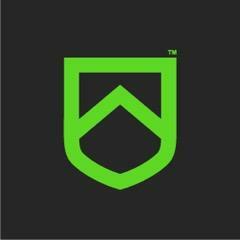 ALTIS, formerly World Athletics Center (the facility where I train), recently changed their brand to a shield. Why? Warriors hold a shield to protect the whole line. We are stronger TOGETHER. 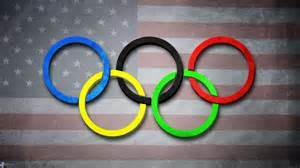 Whether the Olympic Games are written in my future or not, I know I have the best community surrounding me to strengthen my faith and strengthen my body. Iron sharpens iron. Yes, the family at this training center will be a vital aspect to this year, but YOU are part of my army too! Whether you can offer financial assistance or recommend company sponsorship, or just be an encouraging presence, YOU are so appreciated. This is the start of my fundraising drive for 2016: https://shineonrk.wordpress.com/your-donations-help/ ! Here is what the near future looks like for me: I’m a little over a 5 weeks out from receiving PRP on the hamstring tendon at the ischial tuberosity and so far things have been progressing brilliantly. The best word for running healthy again is “free”. I feel free- emotionally and physically (I can get a full stride again). I haven’t tested it with hurdles or jumps yet, but I’m sprinting significantly faster than I have ALL YEAR. I also picked up a job working as a personal trainer at a local gym. I’ve never worked in that setting, so I have been depending on God for strength, wisdom, and confidence. I’m finding opportunities to glorify God through friendly, loving interactions at the gym. Finally, I’m working with Kyle and both families (and Phoebe- shout out to an AMAZING wedding planner) to figure out wedding details. The combination of God’s works and being engaged has given me a sense of urgency to correct some lingering idols and pride within my heart. I feel so much hope for the year ahead. I’m in the right place with an incredibly supportive church, a fiancé whose love and patience is overwhelming, and a team of incredible people in my corner. Thank God. May He use me and may He use you to bring glory to his name through love. A Summer Season of Surprises! I’m looking forward to sharing this update with you! You’ll see why! As you can deduct from the title, this month has been full of unexpected situations (some great, some not-so-great). A few weeks back, my coach shared a youtube video that is helpful for when you come across unforeseen circumstances at the track and in daily life. This is applicable for ANY and ALL. In the video, Tom Chaby introduces the ‘Challenge vs Threat’ model. In any given situation, our perceptions impact our performance. When some form of adversity pops up, your endocrine system creates a physiological response. I’m sure you’ve experienced the instantaneous nervousness and even that gut-dropping feeling when something doesn’t go your way. Whether you realize it or not, your body produces excess cortisol, your vision narrows, breathing becomes more difficult, and performance spirals downward. You took the “threat” route here! This often happens when you are outcome oriented- the situation is valued for nothing more than a Win or a Loss (and the Win means everything!). BUT, did you know that you have the power to change this?! Take the same adverse situation and attack it as a “challenge” and the physiological effects improve performance via increased testosterone, broadened vision, increased creativity, increased strength, and easier breathing! Well, clearly I hope to choose CHALLENGE every time, but HOW? Knowing and believing the truths of God help us to pick CHALLENGE. Whatever the situation may be, the Lord does not leave you. He loves you infinitely more than even your closest human companion. Let Him be your strength and He will deliver you (maybe not in the way we envision, but in a glorious manner). 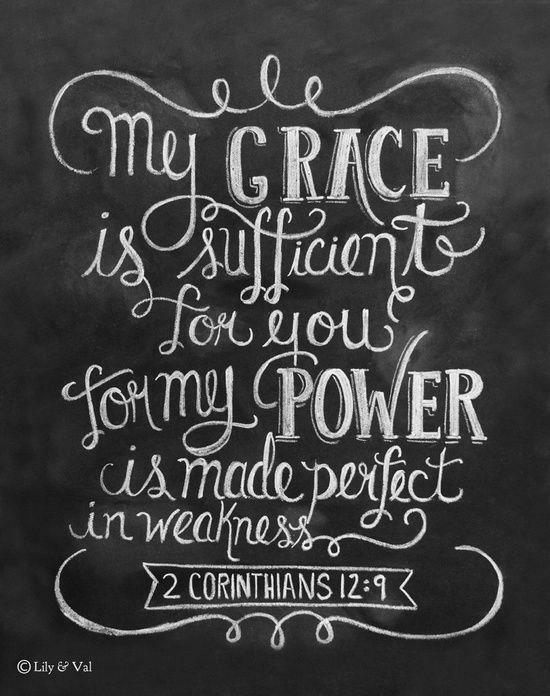 Every challenge is an opportunity to call upon the Lord, recognizing your own weakness and trusting in His power. In my limited experience, I’ve found that the more I have reflected on who God is, the more natural it has become to go down the “challenge” route. Is your identity in Christ or is it in worldly success? Hopefully I haven’t misled you into believing I’ve had a month full of adverse situations! We kicked off the summer by adding a new member to the household family… a PUPPY! We inherited Milo via a church member who saved him from being sent to the pound. 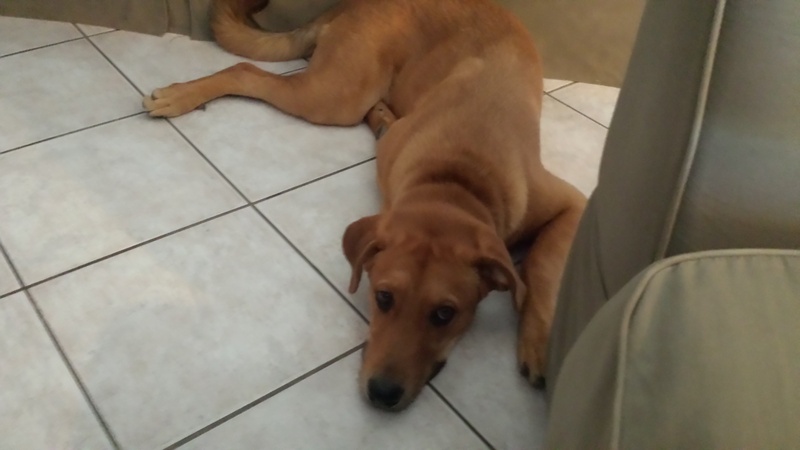 He is a mix between Husky and Ridgeback. At 6 months old he is already big enough to give “walking the dog” a whole new meaning for me! The next surprise was hearing from the USA track and field Heptathlon Coordinator that I was selected to represent USA at the Capital Cup in Canada. 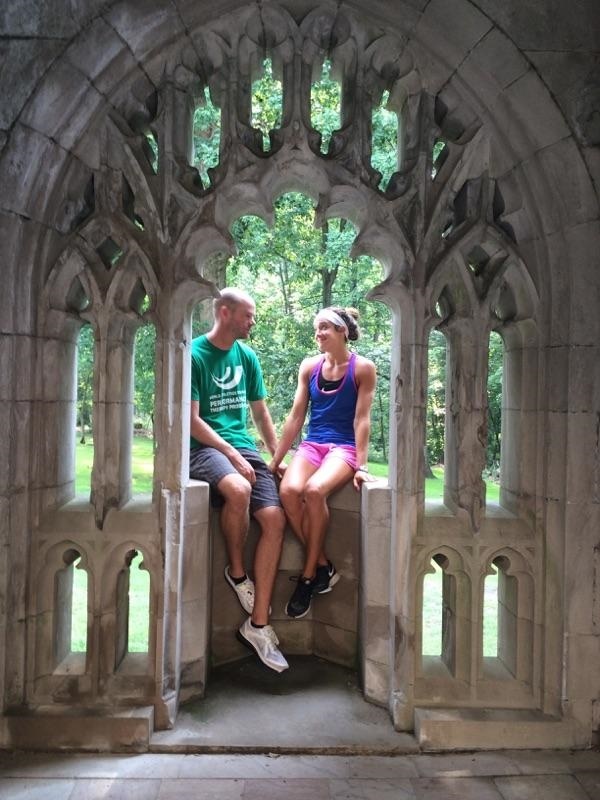 Coming off of my last heptathlon, I felt like I was on the right track health-wise, performance-wise, and spiritually. Well, my hip remained irritated throughout the month between meets and I ended up tweaking my calf due to compensation-issues literally two day before leaving. I really struggled to take the right route in the “challenge vs threat” model. My pre-meet preparation was far less event-specific than I’m used to, but I decided to trust! I trusted that God would carry me through no matter the outcome of the meet and I trusted that I was athletic enough to compete even without my ideal preparation. Over and over again throughout the meet I was presented with opportunities to use the ‘challenge vs threat’ model. I tripped over a hurdle in warm-ups… CHALLENGE. I felt hip-pain during the 200m…threat. I’m a work in progress! Afterwards, I ventured from Ottawa to Toronto to meet up with some incredible doctors. Using dynamic ultrasound, they identified damage at the tendon which connects the hamstring to the ischial tuberosity. The repetitive tear had started calcifying, which resulted in a brittle tendon that was continuously being re-injured. The very next day we decided to do PRP therapy to heal the tendon! After 5 days of complete rest, I’m slowly getting back into modified workouts to allow healing and retrain some of the muscles I haven’t been able to use! peace out Toronto, you’ve been good to me! With my mom’s company, I traveled from Toronto to Philadelphia to spend some time with the family. On July 3rd, I went paddle-boarding with my mom, had dinner with my high school coach (and his wife and child, ah love them! ), and capped off a great day at the fire-pit with the whole family. Then some dude wondered into our backyard. I was a little creeped for a second until I recognized the long-sleeve blue shirt. KYLE!! 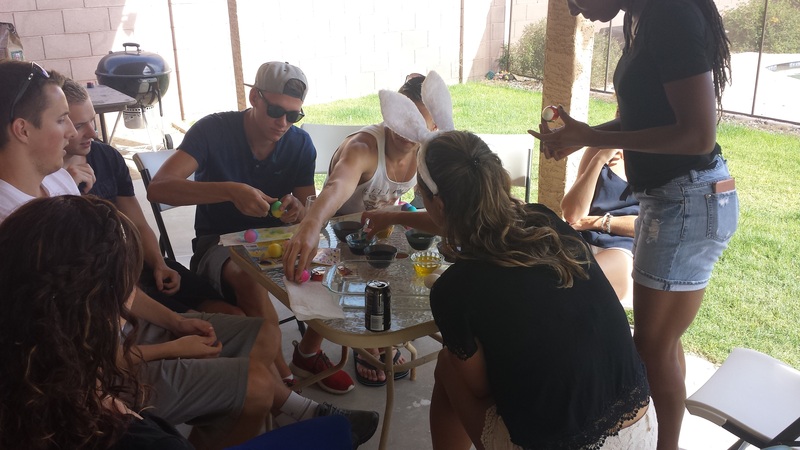 (who was supposedly on a camping trip in Phoenix)…YAY! Surprise! I hugged him… and again…and again (I hadn’t seen him in 2 weeks)! 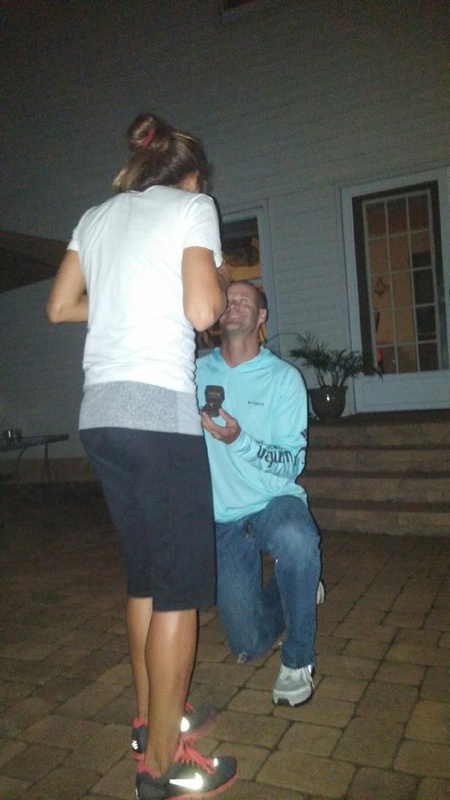 Then he started pushing me off of him (I was flustered like ‘what, my parents don’t care if we hug!’) and he got down on one knee…!!!! I can’t really tell you what happened from there because my mind went somewhere else in giddy-land…but I did say YES (I think twice, actually) and I have a ring! We are getting married! DOUBLE SURPRISE! Have you ever been stuck in a phase of feeling dull or useless? Did you find yourself moping, unconfident, or even to a point where your motivation was dwindling? You continued going through the motions to your maximum capacity but it seemed like nothing could uplift your spirits…so have you been there? I was experiencing this for a period of time throughout the winter months. I’m sure everyone has differences in the specific reasons that got them to that point, but in general, it often comes from the feeling of not achieving what you envision to be your full potential. I bring this up in order to present you with some incredible news: Jesus Christ, who died on the cross so that we may be made righteous in spite of our sinfulness, LIVES IN US. After hearing this in different ways and conversing about this truth over and over, it’s starting to sink in. Yeah, I am weak…. God knows that. But with Him living in me, truly nothing is impossible (whether my will aligns with His will is a different story). That being said, there is no way I want to live a dull life. I don’t want to squander the Holy Spirit inside me. This may sound silly, but Kyle and I made a commitment to no longer give weak high-fives or pounds. Nah, someone empowered by the Holy Spirit does not give passive high-fives, they give “thank God for His blessings and love” high-fives. 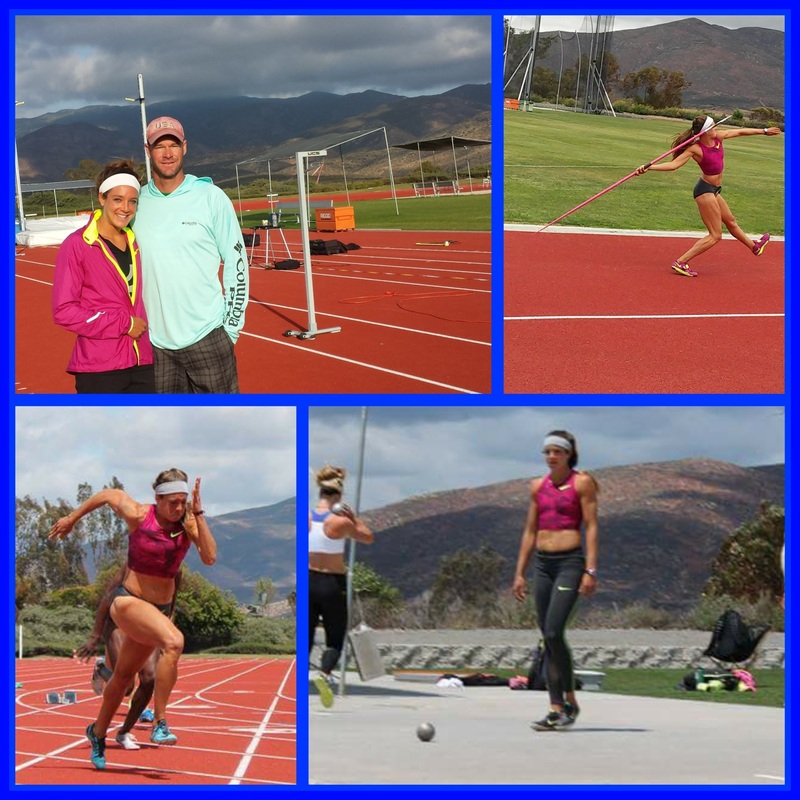 So, with an attitude of EMPOWERMENT, I competed in my first heptathlon of the year at the Olympic Training Center. The statistical results were not mind-blowing, but the overall experience was incredible. If I were living in the past, I would have been severely disappointed, but for the reality of this season, my marks were right in the ranges we predicted. But here is the big news: through 7 events, knowing how much of a perfectionist I’ve been (and never satisfied), I remained joyful! Again, maybe this sounds silly to you, but it has been years since I’ve competed in a heptathlon and walked away from each event thankful to be out there and pumped to proceed onto the next event. 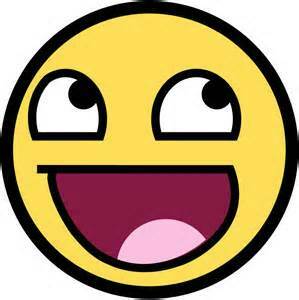 Some of the officials made a comment to me “You were smiling the whole time like you did in high school”. Whew, God is good. I know I’m working hard to compete well and that is all that I can control. But God is sovereign, wise, and loving… I’m in good hands. So are you. To wrap things up and look forward, I was invited to compete for Team USA at the Capital Cup in Ottawa, Canada. From there I will be seeing an incredibly gifted doctor in Toronto to do some imaging on this lingering hip issue. My mom and I will then travel back to Pennsylvania. The remainder of the season will be determined by this doctor’s visit: I’ll either continue competing through the summer (get a 400m hurdle race in) or take the proper measures to fix this hip and get started on OLYMPIC YEAR training! Looking forward to reconnecting with my hometown support group! Side note: I’m looking for sponsorship! If you know of a company willing to help out an athlete, please let me know! I’d love to partake in a mutually beneficial partnership- and one that can be used to REACH OTHERS in love! Championship Season- with God, you ARE ready. For the NCAA, this is Conference Championship week. For high schools across the country, the State Championships are wrapping up or quickly approaching. Even for the professional athletes, the national teams will soon be selected. The track and field community is EXCITED! The athletes step onto the track ready to pour their hearts into the mission. As I think about some of my upcoming meets, I struggle with the question: Am I prepared? Am I good enough? In your life, what challenges and decisions are causing you to ask the same question… an upcoming job interview, a family decision, an opportunity to volunteer, picking a college, joining a church??!?? When you commit to God’s mission, keep your eyes up and allow the Spirit to guide you to great heights…if you are looking down (like this! ), focused on the World, you may land early and miss out on divine appointments. Get in the GAME- spread God’s love! 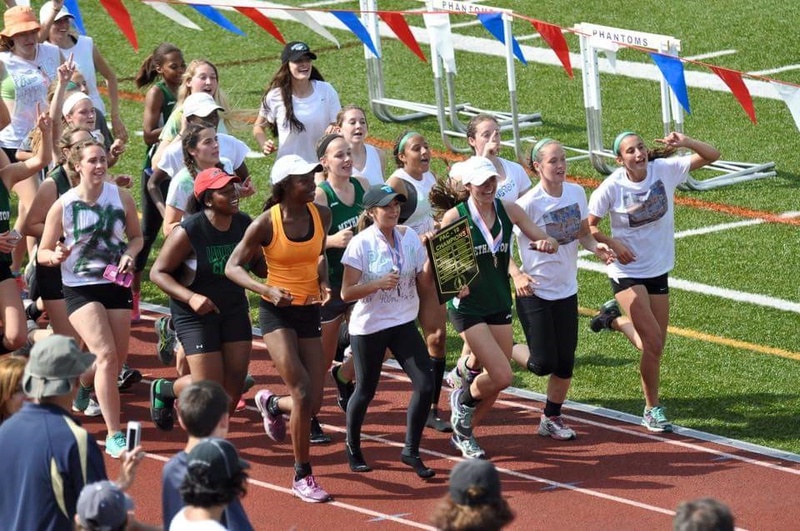 BIG SHOUT OUT to Methacton Girl’s Track and Field… 10th straight League Championship! I’m more proud of the bond they have kept alive in this program. So full of LOVE and friendship! My high school athletes in Phoenix just finished up the State Championship bringing home multiple 5th place finishes. 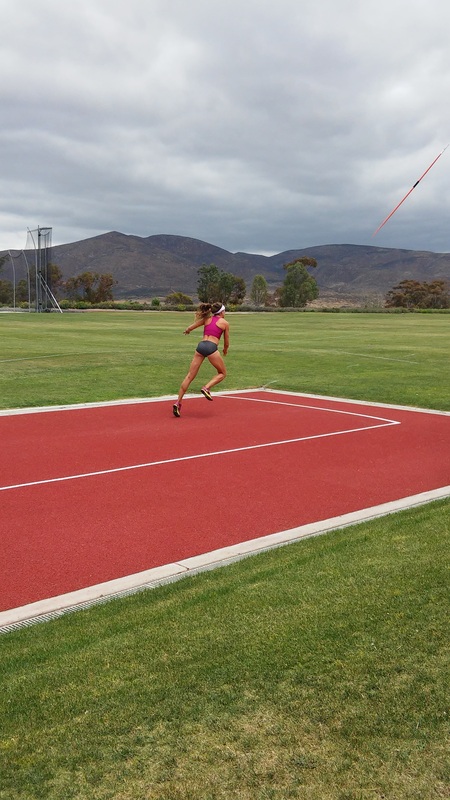 Quick story: About midway through the season I began working with a talented high jump gal. 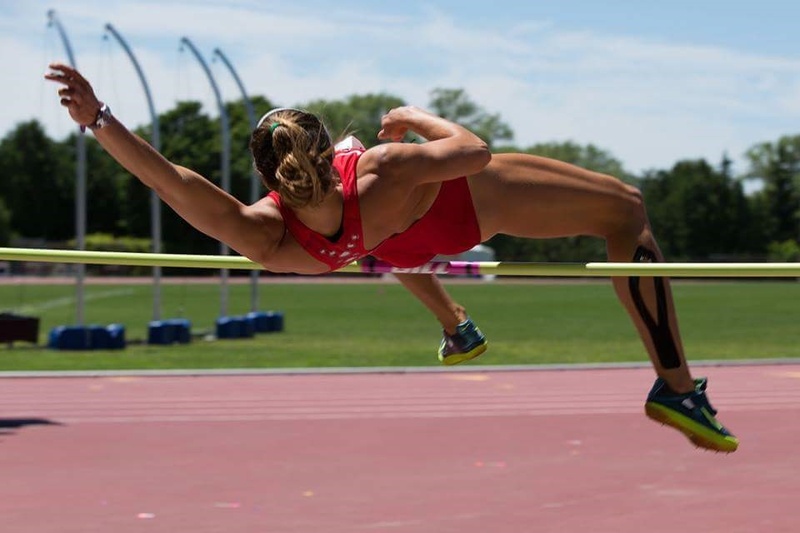 She previously would arrive at a meet and run about 5 steps backwards from the high jump standard and put down her “starting mark” piece of tape… and she had plenty of success doing this for years. At practice one day, I completely revamped her approach so that she was taking 10 steps (with acceleration and a real curve) causing her to approach the bar with more speed (which can be intimidating). The point is: we made a big change to her whole idea of High Jump. The cool thing is that she approached this process with incredible amounts of trust in me… trust that this change would help her jump higher even though it certainly wasn’t immediate gratification. Because of her trust in me, I felt a special connection with her…. I wonder how God feels when we trust Him? 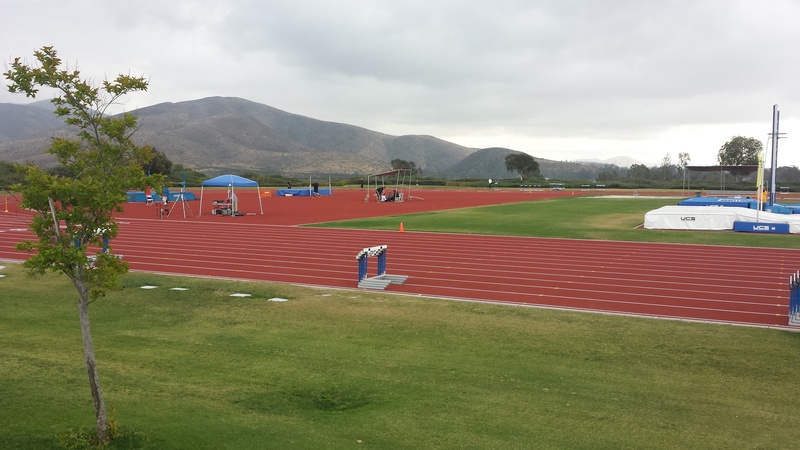 As far as my season goes, another trip to the Olympic Training Center for a heptathlon is on deck. This will give me more information about how we will approach the summer season. My hopes are to represent team USA in an international competition. I’m certainly not opposed to competing in some 400m Hurdle races too! 🙂 Further along in the summer, I hope to see a specialist to put the finishing touches on my healing-hip so that I can approach the Olympic year 100% ready to rock and roll. If you would like to financially contribute, please click on the donation tab! I’ve been finding that the more I learn about Jesus, the more eager I am to get out and serve the world. Now this has sometimes gotten to the point where I question the value of whatever tasks I’m doing now. The big question: WHAT IS MY PURPOSE? Am I serving it? I hope I am not alone in this thus far. Here’s where it gets a bit more specific to athletics… coming back from an injury it is not unique to question “Am I even good at this anymore?” Maybe you feel that way in your job- am I even good at this? Is there value in what I am doing? Can I be doing more? A man was leaving home on a trip and left his 3 servants with an amount of money according to what they were capable of handling. The first servant was left with 5,000 coins. The second servant was left with 2,000 coins to manage. The final servant was left with 1,000 coins. The first two servants went out, invested the coins, and doubled what they had originally been given. The third servant dug a hole in the ground and deposited his coins there. When the master returned home, he was delighted with both the first and second servant, for they had faithfully managed their allotted amounts. “Come on in and share my happiness.” The third servant presented his 1,000 coins to the master and explained that he was afraid, so he hid them in the ground. The master was displeased and took the money away from him, giving it to the first servant. We have all been given different gifts of varying sizes. Go and make the most of what you have been given. For me this means; pour your heart into the track as a way of faithfully serving the Lord. Do not concern yourself with the marks of other athletes or the marks you have previously posted. Go today and make the most of the gifts of today! Being a faithful servant means to work in a way that glorifies God and trust Him to use you in whatever ways He has planned! Do not fret about not being good enough, for if you are doing everything ‘heartily as to the Lord’, he is pleased. When you pour your trust into Him, fear subsides. Don’t hide your coins because of your fleshly burdens (pride, people-pleasing, doubt, perfectionism), but take a risk and leave it to God. Who has been through this? I’d love to hear your wisdom! Please comment or send a message. The high school season is coming to a close and I am sad that I will not be seeing these kids on daily basis until next season. They all seem to have found a spot in my heart. Looking back to day one, I didn’t expect to have this deep of a relationship with these kids. I genuinely experience their delight and their disappointments after races and throughout life occurrences that they choose to share with me. 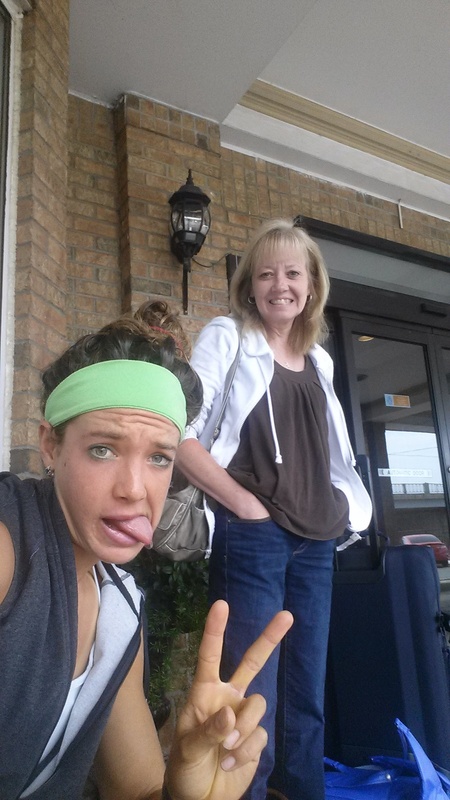 I was laughing the other day when I was named “track mom” by some of the gals on the team. My track family 🙂 has grown so much bigger this year! Something pretty cool: on a day I was struggling to feel like I was contributing to God’s greater purpose, I had about 8 gals on the teams ask if they could come to church with me! OF COURSE! Happy heart. 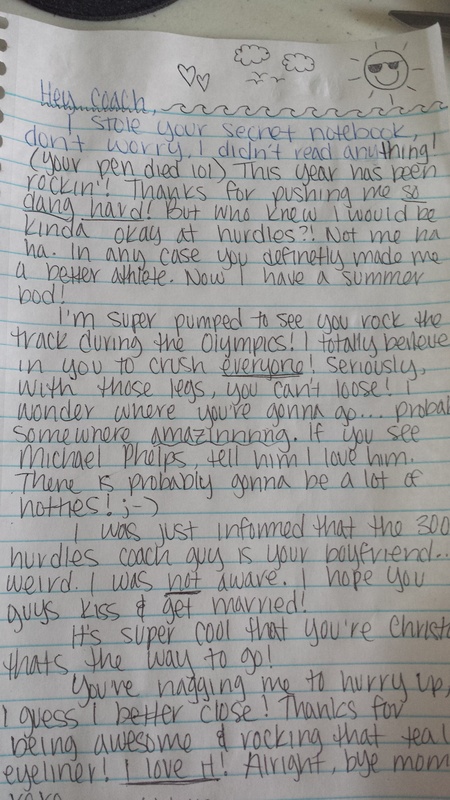 My first letter from a high school athlete that I coach. hehe! 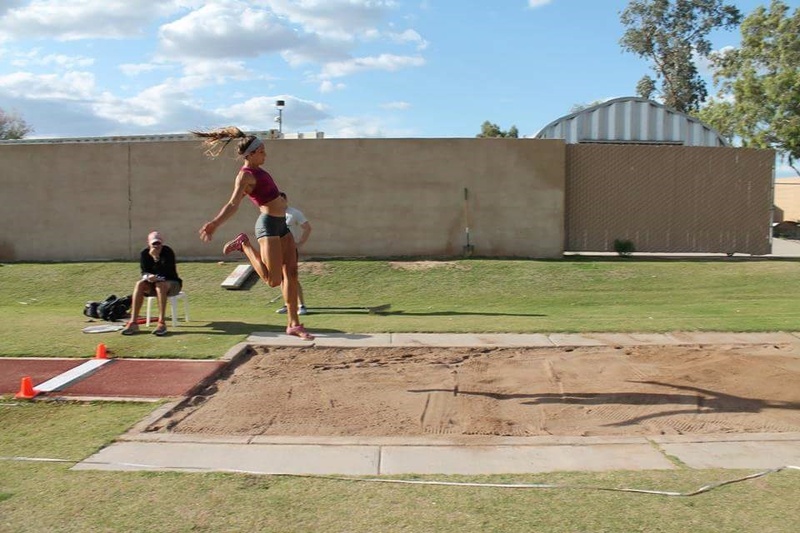 I officially opened up my outdoor season Saturday at Arizona State’s Sun Angel Classic with a first throw PR (personal record) in both the shot put and the javelin. But more importantly, I competed in both a mentally & physically healthy state! I was feeling incredible happiness and peace to be on the track and displaying God’s gifts through performing and interacting with competitors and teammates. This past week we made major strides on the injury that has been lingering since last May thanks to a combination of efforts between therapists, coaches, and a visitor from New Zealand! This has been a huge theme in my journey: God shows some of his abundant AWESOMENESS through people (and there have been so many of these good-hearted people come into my life and help me through my own burdens)! Recently, a physio-therapist associated with the New Zealand track team stopped by World Athletics Center (my training facility) to spend 2 full days analyzing my mechanics and posture so that we could pinpoint and correct this nerve-issue! What is so incredible about this is the fact that she enthusiastically did this with no expectation of compensation. Good people. GOOD GOOD people. Now I have a plan of action to get the hip realigned so the body can actually heal itself AND I have a whole new set of vocabulary words from my foreign friend (ex: dodgey and craptastic both describe my “bad” hip). THANK YOU LORD for filling my life with wonderful people like this! Next up: my high school athletes! Ahhh, LOVE them. We are about to enter the championship part of the season and we are turning into a real team (and by this I mean: friendships are strengthening, athletes are taking risks, there is a growing amount of trust in the process, general encouragement is at a high). Some more cool things going on: We are currently hosting quite a few guests at our house (all Canadian athletes) which makes for a never-ending good-smelling kitchen, lots of fun conversations, extra attention for the dog, and NO refrigerator space (totally worth the sacrifice 🙂 ) On Easter Sunday, a visiting team (Norway) came over for lunch and we all dyed eggs and had an egg-toss competition. Quite entertaining! God is All-powerful. He can do anything, provide anything, change anything. God is All-knowing. He sees the bigger picture that we, as humans, cannot fully grasp. He knows our heart and he knows the hearts of others. God is love. God is on your side. He loves us more than we can understand…He sacrificed his son for us! God is always good. Knowing these 3 things, you can trust Him in every instance. Knowledge, Power, Love. Let your days be flexible and focused on following & glorifying Him! Never be discouraged because He can and will use you in every situation. Put your own plan aside and follow the One who knows all and can control all and loves all. Don’t fight against the guiding Holy Spirit, but walk in line with it. HOW? By making the priority of your life to LOVE GOD and LOVE OTHERS. I’d love to hear from you! How are you shining on? Check out my DONATE tab if you’d like to financially support my journey.